This beautiful coloring book is for readers who want to unwind with a reminder of God's love and purpose for them. We often live our lives worried about to-do lists and responsibilities, forgetting how God feels about us and who we are in him. Because of this struggle, author Susie Larson began posting nightly blessings on Facebook to encourage her fans and friends, and since then, thousands have responded and forwarded the blessings along to others. The lefthand pages of this book contain a blessing packed with biblical promises as well as a related Scripture to point you back to God's timeless truth. The righthand pages contain beautiful, intricate illustrations for you to color that bring God's wonders into focus. Read, rest, and create as you soak in the wonder of God's love for you. My Thoughts: While I was a big fan of coloring books as a child, I didn't think until recently that I'd still get to use them as an adult. So you can imagine that I was pretty happy when the publisher offered me Bountiful Blessings so I could share a review with you guys. 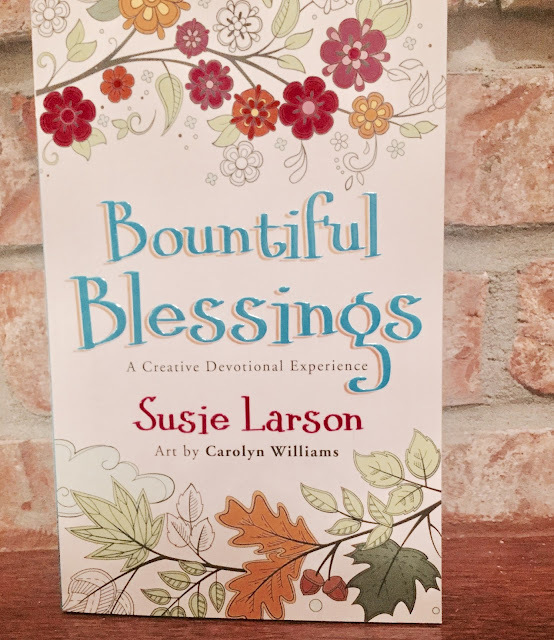 I loved the idea of combining a relaxing coloring book with a devotional and Susie Larson does it so well! It's an easy size to carry around and the messages are great. The total package!